Creating a wonderful, practical and attractive outdoor living space will, if done correctly, add significant value to your home. It also creates an environment which is relaxing, peaceful and welcoming. If you want to transform your LS12 garden into something spectacular and be the envy of your neighbours, then look no further. 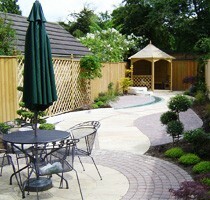 We're experienced landscape gardeners who will work with you to create a garden to your exact specifications. We make it our business to create exactly what you're looking for and doing it at an affordable price. Not forgetting, of course, our focus on quality customer service. If you want the garden of your dreams to become a reality, we'll be happy to talk to you in detail about how we can help. We can assist you with every element of hard and soft landscaping and our expertise and attention to detail make us the perfect option when you are looking for a landscaper. All our work is fully guaranteed for quality and peace of mind. For all your gardening solutions simply pick up the phone and call us now on 0113 370 9072.